What is ADHD (attention deficit hyperactivity disorder)? Also known as ADD (attention deficit disorder) can be controllable through acupuncture, auriculotherapy, and nutritional amino acid therapy. The characteristic of ADD/ADHD are inattention, hyperactivity, and impulsivity behaviors. These symptoms usually appear early in a child's life. Symptoms will appear over the coarse of many months, often with impulsiveness and hyperactivity preceding that of inattention, which may not emerge for a year or more. Some signs of hyperactivty and impulsiveness are: feeling restless, often fidgeting with hands or feet, or squirming while seating, running, climbing, or leaving a seat in situations where sitting or quiet behavior is expected, blurting out answers before hearing the whole question, and having difficulty waiting in line or taking turn. Children who are inattentive have a hard time keeping their minds on any one thing and may get bored with a task after only a few minutes. If they do something they enjoy, they have no problem focusing. But paying attention deliberately, consciously, and completing a task or learning something new is difficult. The DSM-IV-TR (Diagnostic and Statistic Manual of Mental Disorders) gives these signs of inattention: often becoming easily distracted by irrelevant sights and sounds, often failing to pay attention to details and making careless mistake, rarely following instructions carefully and completely losing or forgetting things like toys, or pencils, books, and tools needed for a task, often skipping from one uncompleted activity to another. To assess whether a child has ADHD, specialists consider several critical questions: Are these behaviors excessive, long-term, and pervasive? That is, do they occur more often than in other children of the same age? Are they a continuous problem, not just a response to temporary situation? Do the behaviors occur in several settings or only in specific place like the playground or in the schoolroom? The person's pattern is compared against a set of criteria and characteristics of the disorder as listed in the DSM-IV-TR. For the complete article click on "link". So, if you believed that your child falls under these criteria and characteristics, give us a call and we will do our best to help. 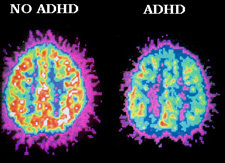 This is a picture of a comparing the brain of an ADHD child and a non-ADHD child (PET scan). Click on "link" to read research.